I recently had the pleasure of making a cake for a friend's 30th birthday. Another friend had contacted me a few weeks earlier, asking if I could make something "weird and cool" for the birthday party, which worked out perfectly because I, myself, can be pretty weird. Aaron is a huge cereal enthusiast so the choice was obvious: I needed to make a cereal box cake. 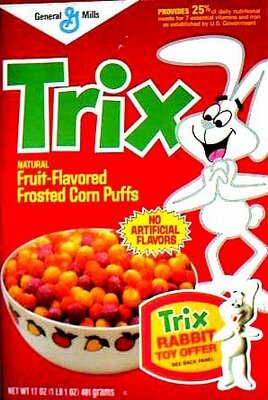 I decided to go with a throwback Trix cereal box from the 80's. 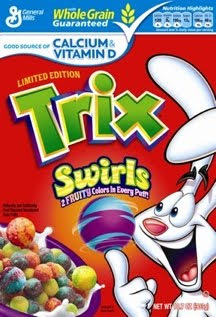 I chose the more classic design, not only because of nostalgia's heartwarming properties, but also because I noticed that the Trix rabbit has grown increasingly high-strung and crackheaded-looking on recent boxes. The cool thing about a cereal box cake is that you only need one pan (9"x13") and, since it's a single layer, it requires no stacking or construction. No dowel rods, no cut straws, no danger of it tipping - it's a great cake if you're working with fondant for the first time. I used Smitten Kitchen's cake recipe. Unfortunately, mine turned out a little on the dry side. It was more dense, like a pound cake. I'll try taking it out of the oven a few minutes earlier next time. 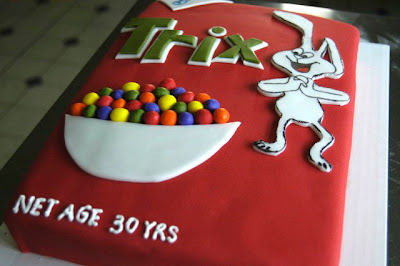 The most time-consuming step was dyeing the fondant to reach that vibrant, candy-apple red you associate with a Trix box. Mike volunteered his hands to help knead and roll. 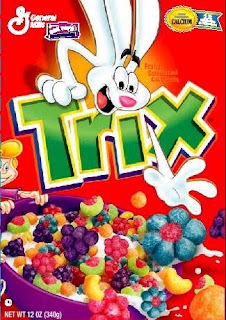 Cutting the letters for "Trix" was pretty easy because it's a simple block font. That's something to consider when you're looking for a design for your cake. The rabbit's details were drawn using food markers. That part was a challenge. Notice the busted rabbit food. The net age was piped on using royal icing. Well, "that's it" is a bit of an exaggeration - this cake took about 8 hours to put together. 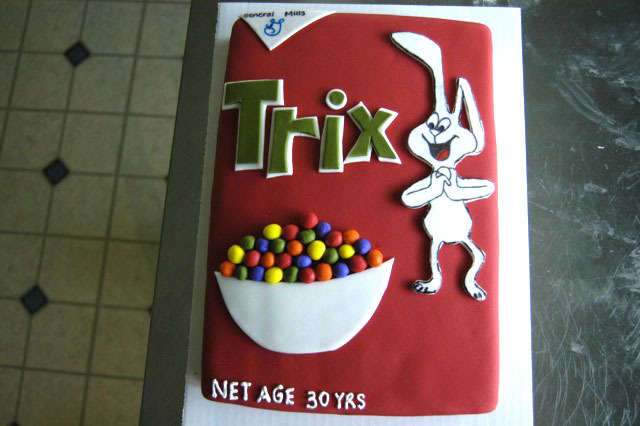 But if you're interested in working with fondant, a cereal box cake is pretty good place to start. Next time you're grocery shopping, walk down the cereal aisle for some inspiration. You can coordinate the cake flavor with the cereal (chocolate cake for a Cocoa Puffs box, a strawberry cake for Frankenberry) or pick a box based solely on its design. The best part? Cake doesn't cut the roof of your mouth. This is just awesome. I am completely in awe. I had the same results with that cake recipe. Next year, I'm asking for a Booberry b'day cake! ALI! This is so awesome! You're so right about the rabbit just becoming more and more crackish as the years went by. He needs to be on Intervention quick. I wonder what Frankenberry would say to him in his letter? Wendi - it's reassuring to know the cake turned out the same way for you, too. What kind of pan did you use? Margie - "Dear Trix Rabbit, I'm here today to tell you how much I miss my friend. 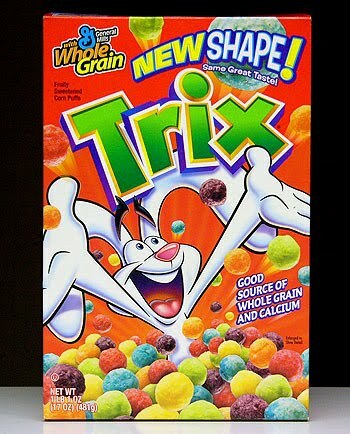 You're not the same rabbit I used to know before they started making Trix in the shape of fruit. I remember we used to have so much fun together, throwing flaming bags of poo on Count Chocula's doorstep on Halloween. Please accept this gift we are offering you today. Trix may be for kids but rehab is available to everyone." this is amazing! i would never have the patience to do this. kudos, it came out great! Ali - This cake looks amazing! I am very impressed with your creativity and attention to details. I love to bake also and look forward to learning some new things from your blog. It was very nice to meet you in the class today. This cake is amazing. Fantastic Job. Thanks for the kind comments, everyone. I'm tempted to make a Grape Nuts cake but somehow, I don't think that go over as well. wow!! this turned out so so well.